Welcome to The Daily Transcript’s "Trusted Advisers." These individuals regularly contribute their depth of experience and credentials for your enterprising success. 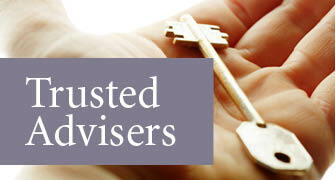 Trusted advisers are in it for a long-term relationship, not a short-term gain. They put clients' interests first and work diligently to understand their clients' underlying needs. The adviser is reliable, certified and credentialed for the opinions expressed in this column. We are pleased to share their insights and valued opinions on various topics that impact your endeavors. Why don’t the wealthy invest more in the best ZIP codes? The three most important things in real estate are location, location, location. We have heard that claim all our lives. California's Title 24 energy code defines the "worst building you can legally build." As California drives towards more efficient buildings, the worst building has gotten a lot better! But codes are never a replacement for good design, and the need for integrated design solutions and early energy planning has never been greater. The San Diego office market continues to strengthen as companies expand their footprints to house their growing workforces. 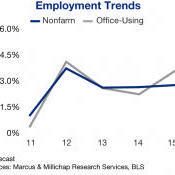 During the past 12 months, office-using employment in the metro has outpaced overall hiring in the market and firms are backfilling underutilized space. Meanwhile, some companies are scouring the area for larger locations. Everywhere you go across metropolitan America, the automobile is ubiquitous. In suburbia, half of developed land is devoted to car parking. In dense cities like San Francisco, streets consume 25 percent of the city's land area – more than all of its parks. In 2007, author and architecture professor Shannon Sanders McDonald published a definitive book on the evolution of the American parking garage. Car parking, she concludes, is the urban planning issue of the modern era. There is a lot of buzz about Zero Net Energy buildings and a lot of confusion. How low can the energy use of a comfortable building go? What strategies are most important and how do they interact? What do they cost? How do you measure it? Meteorologists report the current El Niño event is gaining strength and could become the strongest ever recorded. El Niño occurs when there are warmer than normal ocean surface temperatures in the Pacific Ocean. Changes in the ocean affect atmosphere and climate patterns, and atmosphere changes affect ocean temperatures. All this means that the coming winter is predicted to be a rainy one, and rain will be a welcome relief given our current drought condition. Last year, two desperate people came to me for financial help. They do not know each other, but their financial facts and life situation are similar. Anything of value requires care to maintain its value and usefulness. For instance, vehicles require regular maintenance, whether it’s an oil change, tune-up or tire rotation. If we’re smart we are all taking good care of our bodies by eating properly, exercising and visiting our physicians for annual check-ups. Maintaining a building, residential complex or community association is no different. Potential buyers and residents want to know that their investment in a residence, retail or office space is being protected. Protection begins with a good maintenance plan. Since 1993, Braille Institute San Diego has helped more than 15,000 area residents of all ages who are blind or visually impaired with a broad range of free programs and services. Each year thanks to support from generous donors, Braille Institute San Diego helps thousands of area residents who are blind or visually impaired through a broad range of free classes and programs for students of all ages. This is a first-person story from Braille Institute student Celia M. about how she went from grieving her sight loss to embracing community and leadership opportunities at Braille Institute. An easement gives someone the limited right to use land owned by another. (Occasionally an easement will prohibit a land owner from doing something on his own land). Almost every business needs at least some money to get started. Many seek additional funding at various times after the business is up and running. Often times small business owners don’t know where to find the money they’ll need. How will we be remembered: Legacy of deceit, selfishness and denial or solving unsustainable problem? A poignant cartoon shows two desperate ship wreck survivors in a life raft. We see the circling sharks, but not the lifeboat's other end. One says, "Look at them bail! It's a shame there's a hole in their end of the boat." After a developer acquires a piece of land and establishes a vision for a new common interest development, there is a lot of work to do to bring that vision to reality. Braille Institute’s broad range of programs and services serves people of all ages who are blind or visually impaired. All programs are free of charge. Cresa is the largest tenant-only commercial real estate platform in the world. The decision to represent tenants exclusively positions their clients with a unique and unbiased offering in the real estate market. Simply put, Cresa is a company that is service-oriented rather than transaction-oriented. Water is not the only thing in short supply as California enters its fourth consecutive year of what is becoming its worst-ever drought, putting the world's eighth largest economy and the nation's breadbasket at risk. Unfortunately, claims against commercial landlords for ADA (Americans with Disabilities Act) and other handicapped access violations continue to be common. Several laws enacted recently may reduce the number of ADA lawsuits or reduce potential property owner defense costs and potential liability. However, to minimize exposure, landlords and property managers must act proactively. Braille Institute San Diego believes that one key to its philanthropy lies in providing interactions that feel personal, whether someone is speaking with a student, meeting with a donor, or giving instructions to a volunteer. For Braille Institute San Diego, like many nonprofit organizations, building a strong culture of philanthropy involves more than finding donors in the community to support the center's programs and initiatives. A comprehensive, well-constructed financial plan brings clarity and direction to financial choices clients make everyday. Through the financial planning process, specifically within the area of survivorship, clients can determine if they are able to maintain the same lifestyle that they were accustomed to while their spouse was still living. In most cases, clients want to be able to stay in the same home, maintain their current spending levels, and provide for their children. "Volunteers are the heart of our organization. Thanks in large part to our engaged volunteers, Braille Institute San Diego services remain free for all students and clients. That means our classes, our technology instruction, orientation and mobility training, transportation, library, and more are all free," said Rosie Rascon, Braille Institute San Diego's Volunteer Services Manager. Managing risk is a very important part of every financial plan. There are many types of risk addressed in a well-drafted plan - risk caused by stock market declines, economic instability, death, disability, loss of income and damage to assets like a car or house. These unforeseen events can have devastating financial implications to finances and alter the anticipated outcome of a financial plan. While risk is impossible to avoid, it can be managed appropriately. According to a study published in April 2015 by The Neilsen Company, more than six in every ten respondents said that they use electronic devices to connect with family and friends (65%), get news (63%), listen to music (63%), and/or take pictures/videos (61%). So what does that mean for your business, organization, or favorite cause? Tom Corley was a broke CPA, wondering why some clients were so much better off. He studied hundreds of wealthy people and more than 100 poor Americans. What he learned made him famous, wealthy, and impactful. This piece summarizes many of the key points of his book, Success Habits: The Daily Success Habits of Wealthy Individuals. A customized, well-designed financial plan is discussed at the inception of most relationships at Callan Capital. A financial plan encompasses all areas important to a significant estate including investment management, debt management, tax minimization, trust and estate planning, risk mitigation, philanthropic planning, education and financial independence. The primary purpose of a financial plan is to bring confidence and peace of mind to clients as they make significant wealth decisions. Can termite infestations affect a home's resale value? It's bad enough if you discover a termite infestation in your home and have to call in a pest control company to eradicate those nasty houseguests. However, termite infestations can also have a long-term effect on your home's resale value, especially if you've had more than one infestation. Let's cover a few points for the proactive home seller looking to get the most equity out of a sale. Bankruptcy filings stop evictions. Under our Federal Bankruptcy laws, when a person files bankruptcy, all state court procedures, including unlawful detainers, must immediately stop. This is referred to as an "automatic stay." The automatic stay gives the Bankruptcy Court Trustee time to take control of the bankrupt estate's assets, which includes the lease or rental agreement. Eviction delay firms, sophisticated tenants and our legal system have allowed bankruptcy to cause major delays in the eviction process. Therefore, it is important to understand the process to minimize delays and maximize a landlord's collections. Each year thanks to support from generous donors, Braille Institute San Diego helps thousands of San Diego residents who are blind or visually impaired through free classes and programs for students of all ages. This is a first-person story from Braille Institute student Khanh T. about how she transformed her sight loss into new achievements and goals. 1. What is a trademark? -- A trademark is any word, phrase, symbol, or device that distinguishes one company’s goods or services from those of its competitors. "Smart Growth" and "Sustainability" are hot issues in today's political, planning and design world. For Braille Institute San Diego, one key to success has been building relationships with other community groups, in order to expand awareness of the free opportunities available for its clients and students. Buying or leasing ... When is the right time? Buying or leasing a commercial building is a complex and significant decision tied to business and personal needs, goals, and risk tolerance. An owner/user is going to pay a mortgage (either her own or her landlord’s) either way, while an investor needs to evaluate the financial performance of real estate versus other investments. Reading allows us to open our minds to new ways of thinking, and experience the joy of using our imagination to process stories and ideas. National Library Week, recognized April 12-18 this year, reminds us how literature and scholarship enhance our lives. Commercial real estate is a relationship-driven business — always has been. What business isn't? However, with an ever-growing number of brokers pursuing a finite number of businesses, success in the San Diego commercial real estate industry is, more than ever, determined by the quality of one's relationships. It is a prevailing myth among employers of non-unionized workforces that the National Labor Relations Board ("NLRB") is an administrative body in the foggy distance that has no relevant existence with respect to their businesses, and how they run them. The increasingly clear reality is, however, that the NLRB has a broad reach under Section 7 of the National Labor Relations Act ("NLRA"), which protects the rights of two or more employees to engage in "concerted activities for the purposes of collective bargaining or other mutual aid or protection." As technology evolves, so too does Braille Institute, thanks to the generous support of its donors. One essential way that the center's free classes support students' needs is through unique technology courses that help people who are visually impaired become familiar with and comfortable using everyday technology. Careful lease drafting and negotiation can reduce the potential for future legal problems. With more than three million people in San Diego, the U.S. Census indicates that there are over 65,000 people who are blind or visually impaired. Like many organizations and companies, Braille Institute is always looking for ways to reach new students at the right time with the right message, so that the potential new clients can access free services. This column is the third of four-part series on building and maintaining Legacy Wealth. Rehabbing apartments was my first article; repositioning apartments was the second. Now we will consider investing in classic building in highly desirable areas. Think the beach or Mission Hills. Braille Institute was founded in 1919 by J. Robert Atkinson, a Montana cowboy who was blinded as an adult after a gun accident. Along with running a successful company and answering to shareholders, corporate executives of public companies have something else to worry about — their significant equity positions in their own companies. Used properly, a 10b5-1 plan is a tool that can help executives strategically plan and execute concentrated equity position sales. IRAs and other tax-advantaged accounts are generally considered great vehicles for saving money before and during the early years of retirement. For the past six months, I've had the true pleasure of being sought after by passionate entrepreneurs wanting help in generating some positive press for their soon-to-be-launched Kickstarter campaign. The businesses have run the gamut; from high tech audio devices and cloud-based pet wellness products to personal versions of dry aged meat lockers and restaurants. There are many ways to build legacy wealth. Wise investors select the strategy which best fits their personality, capacity, and goals. This four-part series describes proven legacy wealth strategies. Well-honed procedures determine the difference between mediocre commercial property management and great commercial property management. And the natural outcome of excellent commercial real estate management is a successfully performing asset with solid returns. The right processes can help mitigate unexpected maintenance or budget cuts. The 19-year-old second lieutenant arrived in the trenches inhabited by battle hardened veterans. He didn't know squat. They all understood that. Yet in spite of his inexperience he found ways to lead and saved them all from the single biggest cause of being removed from the front. It wasn't the enemy army that took the biggest toll. As of Jan. 1, 2015, the duty of a real estate agent to disclose in writing his or her representation of a buyer, seller, tenant and/or landlord, including any dual agency relationship, in residential real property transactions extended to transactions involving commercial real property. By its supporters, the amended disclosure law has been touted as "significant," "putting teeth in a new protection," and no less than "changing the face of commercial realty in California." For those who read the law and know the industry, however, all of the ballyhoo over the additional disclosures is enough to leave an agent scratching his or her head. There is no agency in California for an expert to report malfeasance in the handling of a criminal case by attorney, judge or when junk science is suspected by another expert. In addition, an independent criminal defense expert can be constrained by a nondisclosure agreement from revealing to an authority his work product when it documents inappropriate behavior by another expert. If you invest in stocks or work in the financial services industry, chances are 2014 was a pretty good year for you. The S&P 500 and Nasdaq posted gains of 11.4% and 13.4%, respectively, while the Dow finished the year up 7.5%. David Behring, owner of Seattle Seahawks, found joy for the first time with the children of Bosnia. He later defined his life in four stages: stuff, more stuff, different stuff and finally … purpose. Every quarter I have clients on the fence about whether to close on an in-escrow investment or walk away from it. Often, the buyers realize that the owners or the in-place management firm has blundered to such an extent that it affects the value of the property. The previous column discussed the Millionaire Next Door and pointed out how Daily Transcript subscribers, rental owners and millionaires had at least six common traits. Working at the world's largest pure tenant representation firm is a great opportunity to interact with business owners and managers representing a broad range of industries. It gives us a lot of joy to help increase the EBITDA value of the companies we represent. In addition to providing leasing services across the country, we spend a great deal of time working with business owners interested in buying their real estate instead of leasing. Not all commercial buildings are created equal. One of the most overlooked aspects of a building's value to the tenant is the ratio of space the tenant leases within their four walls (the usable square footage) versus the amount of space attributed to all common areas of the building. Our culture confuses living "the high life" with being wealthy. In America, many thousands of families with middle class incomes are wealthier than those with higher incomes, who are assumed to be "rich." This two-part article considers a dozen things that Transcript subscribers, millionaires and income property investors have in common. You'll read three reasons why real estate investors are more likely to be millionaires than families with equal or greater incomes. Nearly 20 million visitors have passed through the doors of the San Diego Convention Center since it opened 25 years ago this month. The center has emerged as the cornerstone of San Diego’s third largest industry, hospitality, and has generated more than $24 billion in regional economic impact by hosting more than 5,000 events. San Diego’s zoning and slow growth policies have combined to restrict apartment construction for at least the next 30 years. Though not the only criteria, commercial real estate owners, investors and tenants have a fundamental requirement of the broker advisors they choose: "show me how much you have made or how much you have saved me!" It is a simple and straight forward message that over my 30+ years in the commercial real estate field has proven itself to be true over and over again…whether expressed or simply implied. Office lease negotiations: What traps should a tenant look for? Lease forms created by commercial landlords are typically absurdly one-sided. Nevertheless, tenants are often too quick to accept a landlord's "standard form" lease. This approach can lead to later regrets when costly issues arise. Small Business Owners: Do you understand your customers? There are many challenges that small businesses in America face, and the likelihood of the challenges decreasing in the coming years is not evident. The downtown San Diego real estate market is thriving, with a variety of new mixed-use developments and a revitalized waterfront opening new avenues for retail and restaurant venues in the area. The holiday season brings many desirable things to a retail center: a fresh holiday look, a sense of excitement and anticipation, and the most important thing — more traffic and customers. Dirt today. Tech and R&D campus tomorrow. Tucked against the iconic eucalyptus trees of Scripps Ranch is a land holding that will produce one of the most anticipated office developments in San Diego since the economy slowed in 2008. There is a limit in what a tenant should expect from its broker when it comes to navigating the nuances of a complex commercial lease document. The adage "time is money" couldn't be more pertinent to the construction industry. As business and production costs rise, adapting to new technology will no longer be a benefit, but a necessity. Construction software dramatically increases project communications, collaboration, and organization, in turn escalating efficiency, productivity and profitability. This series explains why rental ownership safely and steadily builds wealth. Tax shelter, deferred taxes on profits, and San Diego’s unique apartment ownership topography, all make rental owners rich faster and safer. Read to learn how to get on San Diego’s conveyer belt to riches. The suspicious death of Marine Col. James E. Sabow occurred in 1991 in the backyard of his home in the now-closed El Toro MCAS Orange County, Calif. In 2003, Congressman Duncan Hunter, chairman of the House Armed Services Committee, became aware of the controversy surrounding Sabow’s death. He wrote into the Defense Authorization Act of 2004 (Section 584) (www.meixatech.com/DefenseAuthAct-2004.pdf), compelling the Department of Defense (DOD) to reinvestigate Col. Sabow’s death. Thousands of investors who bought and held San Diego County apartments became and remained millionaires. Apartments have proved to be safer than other investments. Fortunes were made and lost in businesses, stocks, precious metals, bonds, industrial and retail investments. Shustak & Partners, P.C. Congratulates 'Young Attorney' Finalist George C. Miller, Esq. We are pleased to announce that our senior associate, George C. Miller, Esq., has been named a finalist for the San Diego Daily Transcript's "Young Attorneys" list.